OutCide's soft wash roof cleaning system is suitable for all kinds of pitched roof coverings including; natural stone slates and tiles, fibre cement slates, concrete tiles, clay tiles, and pressed metal sheets. This safe and modern treatment is highly effective against biological growth like moss, green algae, lichens, and the unsightly black streaks often seen on slate roofs across Galway and Mayo. To clean your roof we apply Algoclear® Pro Softwash (Professional Use Only) using a high-reach pole & brush system from the level of the eaves. This means that for the majority of houses we do not need to physically get onto the roof or use harsh, high pressure power washing jets, both of which can cause damage to your slates or tiles. Designed for weather conditions in Ireland, Algoclear® Pro Softwash kills the moss, algae and lichen within 2 hours of application and the cleaning process starts to act immediately, with visible results sometimes as soon as 24 hours. In order to ensure all of the roof is evenly treated, any large build ups of moss are carefully removed by hand before Algoclear® Pro Softwash is applied. The biocide chemical solution kills the actual biological growth, and the weather cycles of rain and sun continue to detach the remaining material from the roof surface over the next couple of months. The cleaning timeframe varies from roof to roof and the severity of the weather, but cleaning is normally complete within a year and the process will continue for up to two years. While traditional jet washing and power washing may provide an immediate visual quick fix, it does not actually kill the moss, lichen or algae, and the consequent abrasion of the surface will cause rapid regrowth. 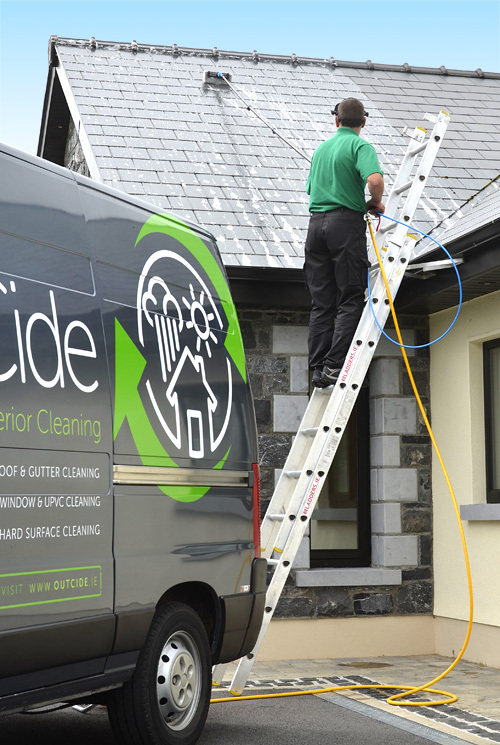 For more information or a free survey of roof cleaning for your house in Galway or Mayo, please contact Seamus Staunton on 086 820 4711 or email info@OutCide.ie. We will be happy to provide a no obligation quote and estimate the timeframe results should expect to see on your property.